3/8 in. Barbed Fittings Incl. The Holley In-Line Electric Fuel Pumps are universal pumps intended for fuel injection applications and can be used with throttle body, multipoint, and forced induction. The in-line (not in-tank) design makes installation easy. Rated for continuous service, pumps have been tested up to 2500 hours and should be mounted below tank's fuel level for a good gravity feed on the inlet side. Does Holley 12-927 fit your vehicle? 12-927 is rated 5.0 out of 5 by 1. 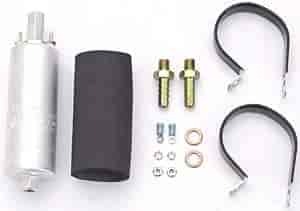 This pump is for fuel injection and not carb compatible.